Persoonlijke voorkeur; Blonde (3x), 6 (4x), gelijk (3x). • At the beginning of 2005 there was a new addition to the Jenlain family, in the form of a special beer with 7.5% alcohol by volume. Little sister of the majestic Jenlain Ambrée, this queen of beers, Jenlain Blonde is high on taste, like any self-respecting blond beer. A happy event for all traditional blond beer enthusiasts! • Kept for 40 days in the vat, it matures slowly to release its full aroma and develop a fine, long-lasting head. After filtration, it takes on a splendid golden hue and is best enjoyed when served chilled at between 6 and 8°C. 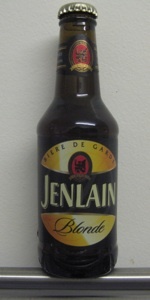 • Packaged in the same way as its illustrious forerunner, declared Taste of the Year 2006 and winner of a Silver Medal at the 2006 Paris Agricultural Show, Jenlain Blonde has been so successful that Brasserie Duyck is now selling it in six-packs of 25cl bottles and in 50cl cans. Yet another example of how the brewery remains faithful to its values of authenticity and modernity, again awarded the “Taste of the Year 2008” label!